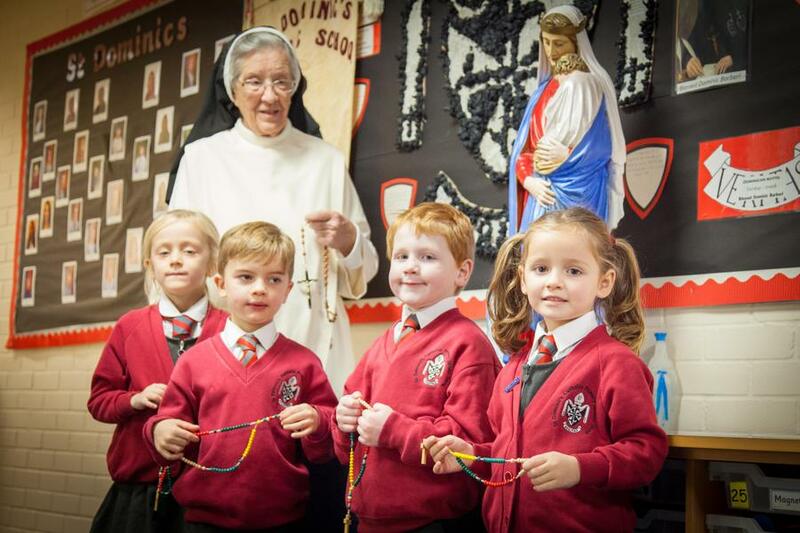 As the community of St Dominic’s we aim to create excellence through providing opportunities for individuals to fulfil their educational, spiritual, emotional, social and moral potential, as we continually nurture all at St Dominic’s as children of God. the individuals within it to come to a personal knowledge of Jesus Christ and an understanding of the Catholic Faith. To provide Religious Education for all pupils in accordance with the Curriculum Directory for Catholic Schools as regulated by the Archdiocese and to deliver a broad, well-balanced creative curriculum. To foster a secure, caring and supportive environment within the school community where every member can feel valued. To ensure that the experience of relationships within the school community is one firmly based on the Gospel values of love, justice, forgiveness and reconciliation. To promote a close and co-operative relationship between home, parish and school so that there is a true partnership in all aspects of the education of our children and that they are adequately prepared to take their place as members of the wider community. We wish to provide the ethos and climate in which the faith of all members may grow and develop. Opportunity for reflection, daily prayer and regular invitations to the celebration of the Eucharist are fundamental to the life of the school. We value each person as a child of God, created in the image and likeness of God; each member with their own personal dignity, uniqueness and worth. We believe that each person is equal to others regardless of gender, nationality, colour, creed, class, wealth or intellectual ability. The overall embracing aim is to enable each person to fully develop his or her individual talents and to use these gifts for the benefit of the society in which they live. We want the children at St Dominic’s to be happy and to enjoy and remember their years here. At St Dominic’s each child will be known and loved; valued and cared for and provided with equality of opportunity in a community which strives for excellence for all.